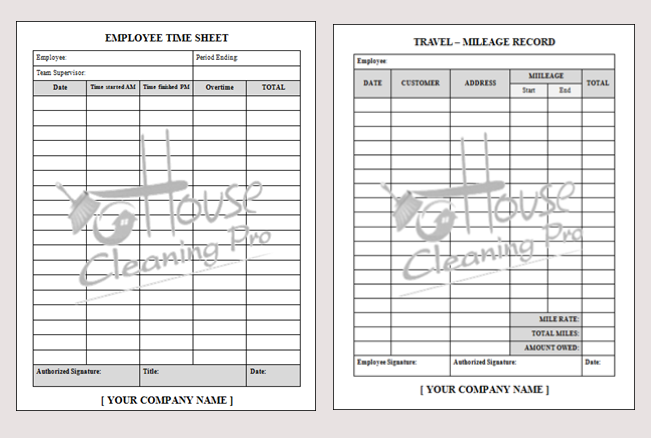 Time Sheet & Mileage Forms $9.00 This mini employee bundle contains a one-page Time Sheet and Mileage document delivered in MS Word format. We have included access to an alternate free document editing software (in case you don't have MS Word) and instructions to customize the documents for your business. NOTE: This form is included in the Custom Business Forms package. Guarantee/Refund Policy: There are NO refunds on business forms because they are templates you can customize for your business. If you have ANY trouble using them, we will provide you with one hour of personal coaching to guide you to success and we will help you customize the forms.